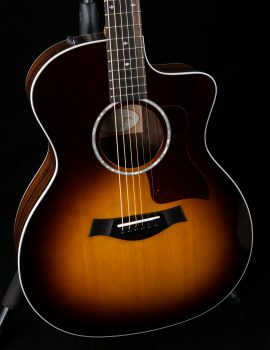 The cutaway acoustic/electric Grand Auditorium 414ce has long been a staple of gigging and recreational players thanks to its musical versatility and clean, workmanlike aesthetic. 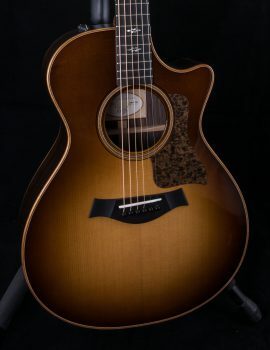 Crafted with back and sides of solid African ovangkol and a solid Sitka spruce top, the 414ce now also features our V-Class bracing, a game-changing sonic engine that powers these tonewoods to produce more volume, longer sustain, and stronger projection. The more orderly movement of the top, courtesy of the new bracing design, also improves the intonation up and down the neck, making chords sing like never before, without sour notes or the “rub” of slight dissonance within certain chords. The difference comes through loud and clear, whether you’re on the couch, recording into a mic, or plugged in at a gig. The ovangkol/Sitka pairing yields a mix of powerful midrange frequencies, strong, clear treble notes, and deep yet balanced lows, and together with V-Class, make this a superb all-around guitar. Fingerpickers, flatpickers and strummers each will find something to love here. Appointments include crisp white binding, Diamond fretboard/peghead inlays in Italian acrylic, and proprietary ES2 electronics. The guitar ships in a deluxe hardshell case.